Adobe just released a new whitepaper on Career and Technical Education (CTE). Beating the odds: Keeping kids in school with career technical education and Adobe certifications explores the role of CTE in reducing the dropout rate, and discusses strategies, results, Adobe Project-based curricula and steps to develop a Digital Media Career Academy. Join Jana Hambruch, coordinator of Technical, Career and Adult Education for Lee County Public Schools in Florida, for a look at the integral role Adobe plays in her district’s groundbreaking career and technical education programs. Hambruch will show you how those programs—featuring industry-standard Adobe® Creative Suite® software and the Adobe Certified Associate credential—engage students and prepare them to participate fully in the 21st century. 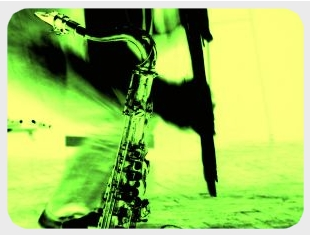 Check out this comprehensive list about best blogs for jazz students below. Accredited Online Colleges.com's blog summarizes, "Ever since jazz burst onto the music scene, it has left an indelible impression on a diverse selection of creative types — and not just those singing or playing an instrument, either, which is hardly surprising, considering the genre’s multifaceted forms and exceptionally storied history. Music students continue to turn towards obscure and famous jazz greats alike for inspiration when composing and performing, and even those entirely incapable of either still enjoy delving into the absolutely fascinating people, places and events that came to shape its many guises. As with any passion, most especially one as broad and encompassing as jazz, there exists a plethora of blogs and other online resources for exploring every corner, however tiny or obscure. This is by no means a comprehensive list, nor is it one ranking entrants in any particular order. It merely provides a valuable sampling of the ideas and insights available to professionals, amateurs, hobbyists and students." 1. A Blog Supreme/NPR Jazz:: National Public Radio keeps jazz aficionados updated on the latest relevant news and opinions on their dedicated, frequently-updated blog. Be sure to visit the accompanying website as well, most especially the featured recordings by established and future greats. Emma Taylor has been in touch to reminds us about this recent published article below. E-learning, like most aspects of the applied sciences and education, is a rapidly growing and changing field. New technologies are constantly being implemented that let students and teachers better interact both in the classroom and outside of it — not only at the college level, but in K-12 schools around the world. 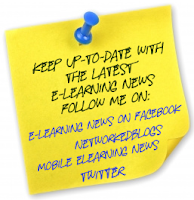 If you’re an educator trying to keep up or a college student who wants to emerge on the market well-versed on the latest educational technology trends, here are some things you should certainly keep your eye on today (and in the coming years). Apple’s tablet computer, the iPad, has proven to be popular with not only everyday consumers but educators as well. Grants from both public and private sources have allowed schools across the nation to provide them to students. These tablet devices are easy-to-use and perfect for classrooms involving a wide variety of learning styles. Students can complete assignments on the iPad, share their work with teachers and peers, read textbooks, take notes, blog, play educational games, write papers and much more. Teachers are also able to easily monitor progress and even grade papers right through their device, saving time, paper and allowing for better feedback. Students who take classes outside of the school setting, or who are homeschooled, may also find the gadget useful in learning, as it is incredibly portable and powerful. There are some who criticize the use of iPads in the classroom, but with hundreds of thousands of them available to students, they’re unlikely to go anywhere anytime soon. Many thanks to Emma Taylor. 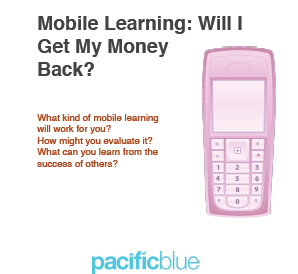 Free Mobile Learning guide: Will I get my money back? It's about choosing the best type of mobile learning for your organisation, thinking about how to measure and evaluate it and so helps to answer the big question on ROI. Mobile Learning. You’re enthusiastic. Your learners want it. You’d love to try it out. But can you make the business case? Today I have Brianna Davis as guest blogger. Please be sure to check out her unique guest post. Guest posts are always welcome, please contact me. • It is understood: Not everyone gets technology, and some folks are just plain reluctant to use it because they’re afraid they don’t know how to. So when you introduce technology in such situations, it’s not going to be used because it is not understood. Efforts must first be made to get those who will use the technology on a regular basis to understand it, before investing time and money in introducing it into an academic setting. • It is not distractive: Technology is a hindrance at times because of the disruptive power it wields – what with all the options that it offers, it’s not easy for students to resist the temptation to use it for reasons that are not academic. 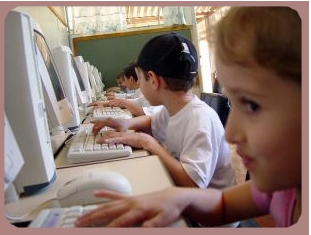 Social media, online games and other distractions prevent technology from being put to the most effective use in education, so unless filters and other technology are used to keep out these distractions, or unless learners are disciplined and mature enough to avoid them on their own, technology is not going to augment education in any way. • It is used: This may sound like a no-brainer, but how many of us actually utilize the full power of technology? We may tap the tip of the iceberg, but most of the time, the rest of its potential is ignored. We revert back to the old way of doing things, or we use the technology but do so less effectively than optimal; whatever the reason, when technology is unused or used half-heartedly, it serves no purpose in the world of education. • It makes a difference: Very often, you hear stories of how much time, effort and money have gone into bringing technology to an academic institution, but in spite of the sophisticated and innovative new system, there’s not much of a difference or improvement in the way things are done. In this case, efforts must be made to include technology as part of everyday life at the institution, and only then can you actually gauge if it is making a difference or not. For technology to be useful in the field of education, it has to make learning easier and more accessible to many more people, and also minimize the disturbances and distractions that are an integral part of it. This guest post is contributed by Brianna Davis, who writes on the topic of bachelor of arts online . Many thanks to Brianna Davis. "Making a video about a scientific experiment rather than writing up a presentation poster leads to better learning and clearer understanding of the concepts underpinning the experiment according to science educators in Australia." reports ScienceDaily. Writing in the International Journal of Innovation and Learning, the researchers explain how preparation and rehearsals for video production also helped with learning. Geoff Hilton of the School of Education, at the University of Queensland in Brisbane asked two groups of year 7 students (one class with 21 students, one with 22) of mixed ability and mixed gender to complete a science investigation. One group was asked to record their findings in a written format to produce a science poster as the final part of the work. The second group was asked to produce a video instead. Hilton found that the completion of these two types of task once the science experiment was completed, elicited from the students a number of different behaviors that influenced their learning. "Educational technological innovations such as in-class video production, combined with appropriate teacher pedagogy, can enhance students' science learning," concludes Hilton. In a "Free Guide: Virtual Classrooms" published this week, Kineo explores the market and guides you to the right ones to explore. Kineo look at open source and commercial virtual classroom options and present you with all you need to know about why you should be considering virtual classrooms, how to make the most of them, and which ones are the top ones to consider in our view. In an independent review of the market, Kineo looks at the options for virtual classrooms and webinars, and with so many newcomers, updates and takeovers since we last did a review, there is plenty to talk about. This free guide and many more are available from the Kineo Free Thinking e-learning reports area of Kineo's website. Whether you have the iPad or iPad 2, most parents load at least a few educational apps on their device for children. If you’re interested in kids apps, Alphabytes is a new one that helps kids master the alphabet, practice writing, test their memory and learn to spell. Start Alphabytes and pick one of the four activities. Tap the letters in the left corner of the screen and a bowl of cereal appears. Kids can then select different letters in the bowl to get interactive examples related to each. Hammer a few nails, draw with a pencil, strum the zither and much more in this great app. Revolutions in higher education: how many dimensions of openness? Check out Stephen Downes post today. Stephen Downes summarizes, "Sir John Daniel strikes me here as the one who sees himself as holding the fort for the university against the unruly masses." "The world of academia is a rigid hierarchy, a world of titles and peerage, of appointments to positions of authority for life, of slow reflexes, impervious to change, and little regard for the needs of the of common people. That there is so little value in teaching, so slight heed to the barriers of rising tuition and limited access, such slowness to adapt to technology, ought to be seen as damning arguments against its continued existence, to be seen as evidence that they are not qualified to evaluate for knowledge and grant credentials. There may be some ceremonial value in traditional academia. But it's time they handed over the keys to the fortress to the people who, quite rightly, own it." This is the first issue of the year 2011. In this issue it is published 4 notes for Editor, 13 articles, 2 book reviews. And this time, 34 authors from 11 different countries are placed. These published articles are from Cayman Islands, Germany, Greece, India, Iran, Malaysia, Pakistan, Turkey, USA and Zimbabwe. 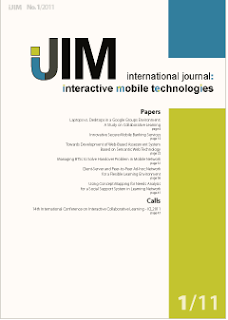 International Journal of Interactive Mobile Technologies (iJIM) has published its latest issue. 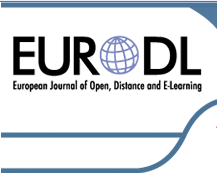 George Siemens and Gráinne Conole writes, "This special issue of IRRODL provides an opportunity to step back and reflect on how these dramatic social and technological changes impact education. In 2004, connectivism was presented as a new theory of learning that addresses learning in complex, social, networked environments." Since that time, numerous articles, open online courses, and online conferences have explored connectivism’s application in education. As articles in this issue reflect, sharp criticism and support have been offered. We hope this issue will help to advance the discussion, to clarify areas of needed research, and to contribute to ongoing debate about the influence of the Internet on teaching and learning. Just look at this interesting line-up below. Take a look at these articles, appears in EURODL. The study examines the outcome of pedagogic practices in the digital age, in pre and post technology supported applications (Al-Khatib, 2009). The aim is to identify quantitative and qualitative indicators that relate to applying technology enhanced learning. Participants are senior students of linguistics doing project research and utilizing virtual forums to facilitate dialogue and debate on set tasks. Learners' performance was recorded quantitatively and qualitatively for the period of two consecutive academic semesters. This research investigated Irish Small to Medium Sized Educational Institutions (SMSEs) involved in Higher Education (HE) that adopted Moodle, the OSS (Open Source Software) course management system (CMS). As Moodle has only been adopted in the Irish HE sector in the last 5-7 years, this research crucially studied the attitudes of the SMSEs that have invested in it to uncover the influencing factors (lessons learned, rationale) concerning OSS adoption in HE from the view point of the smaller colleges. A full population of Small and Medium Sized Educational Institutions, large colleges and universities in HE operating in Ireland that utilize Moodle were included in this research. A variety of Open Source Moodle service providers (large and small) operating in Ireland were also included in this research. This research found a high degree of improved confidence in additional Open Source core system adoption and integration in SMSEs resulting from Moodle adoption. This confidence has been a direct result of the Moodle experience and the supportive community that has been found to encapsulate it. The Moodle experience in Ireland has, without doubt, challenged traditional preconceptions and fears concerning core OSS adoption. In addition, proactive SMSEs have benefited greatly in Moodle assistance from other colleges, particularly the universities. Quality external Moodle support service has been viewed very positively. This research also suggests that Moodle has helped to realize long term Managed/Virtual Learning Environment (M/VLE) aspirations of SMSEs as they continuously strive for competitiveness as the most financially vulnerable players in Higher Education. This research adds to the advancement of what is known about OSS expansion in education that importantly extends beyond the Irish HE domain.